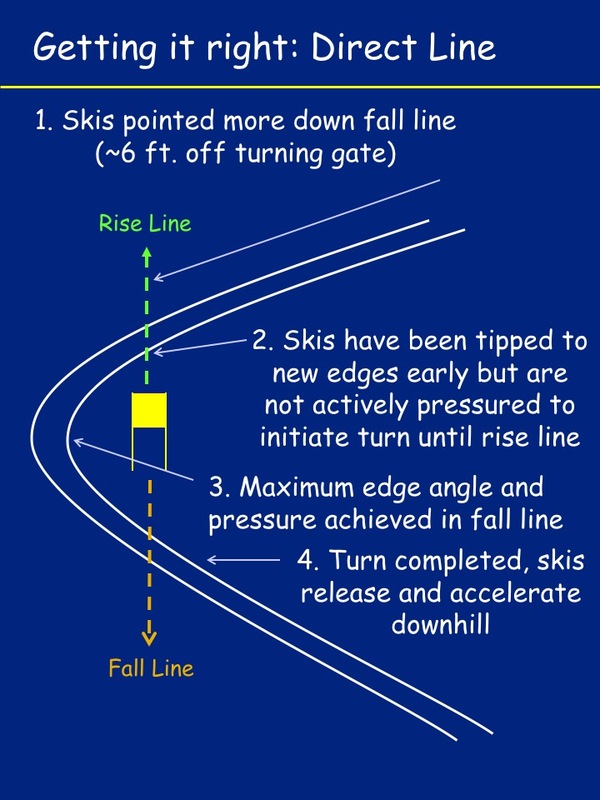 A guest blog from coach Mark Holman (USSA) - a great presentation on tactics, specifically line selection in GS to maximize speed, the differences between the high line and the direct line. With Mark's permission, I will "narrate" and comment on each slide, to add some missing context for those not familiar with the terminology. The fall line is the line down the hill from the gate, or "under the gate". 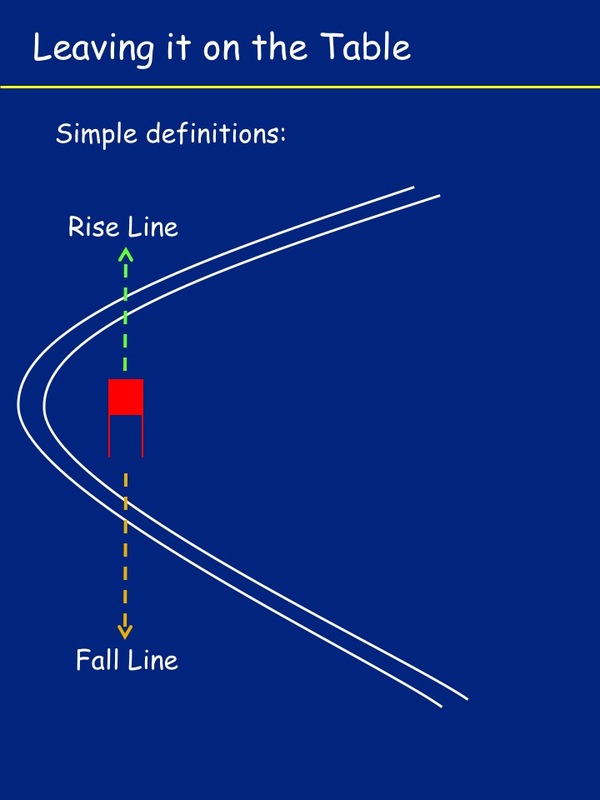 The rise line is an imaginary line, directly up the hill from the gate, or "above the gate". 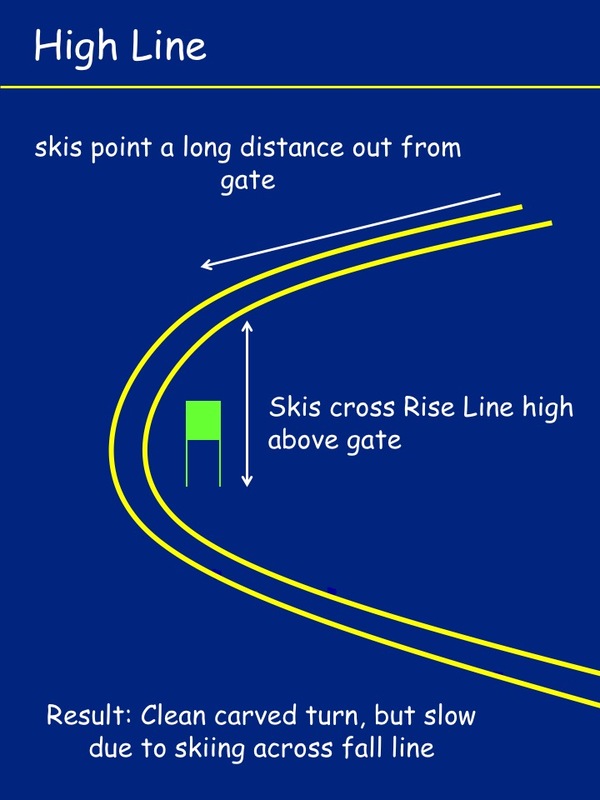 The high line is the safe carving line, when the skier is early at the gate, starts carving well above the gate and completes the arc under the gate. Note that the skis are still pointing well out (across the hill) far above the gate. The skis cross the rise line well above the gate. 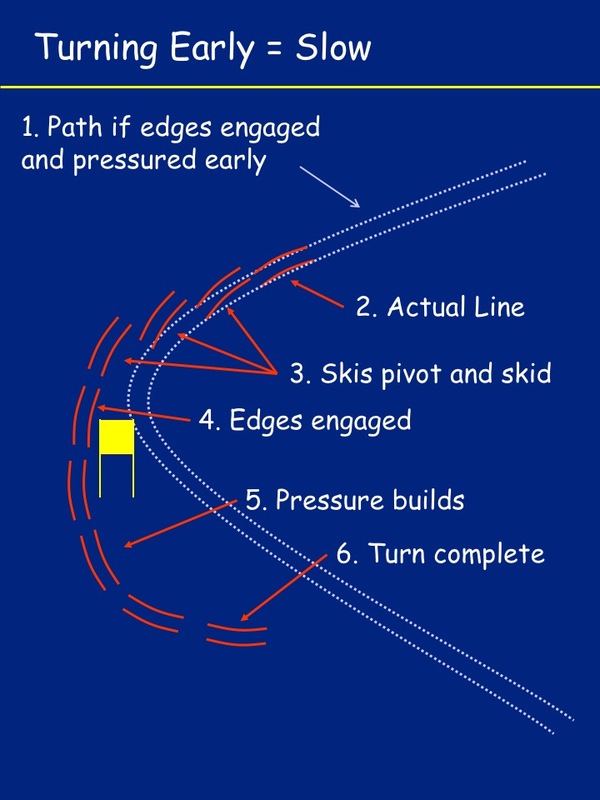 This is a typical carved line, also considered the "safe" line because the skier has quite a bit of time to complete the turn, deal with terrain whatnot and then make it early to the next gate. On the other hand, although easy to carve cleanly, this is not the fastest line. One common mistake is turning it too early and having to "feather" or slide the skis to make it around the gate. This is also slow and as you can see, the skier tends to come out late under the gate. 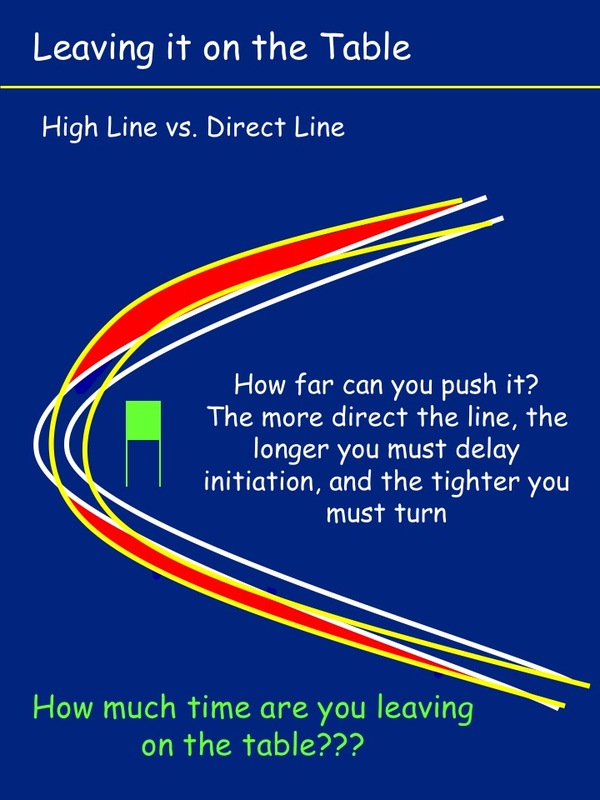 The direct line is just that: more direct at the gate than the high line. To start with, the skis are not pointing as much across the hill above the gate, but more down the hill, towards the gate - in this case, a good "target" would be something like 6 ft from the gate. Gliding on a flat ski is not the best idea here, so the skis will be tipped on edge early, but not actively pressured to initiate the turn, until the rise line. Otherwise, the skis will start turning too early. 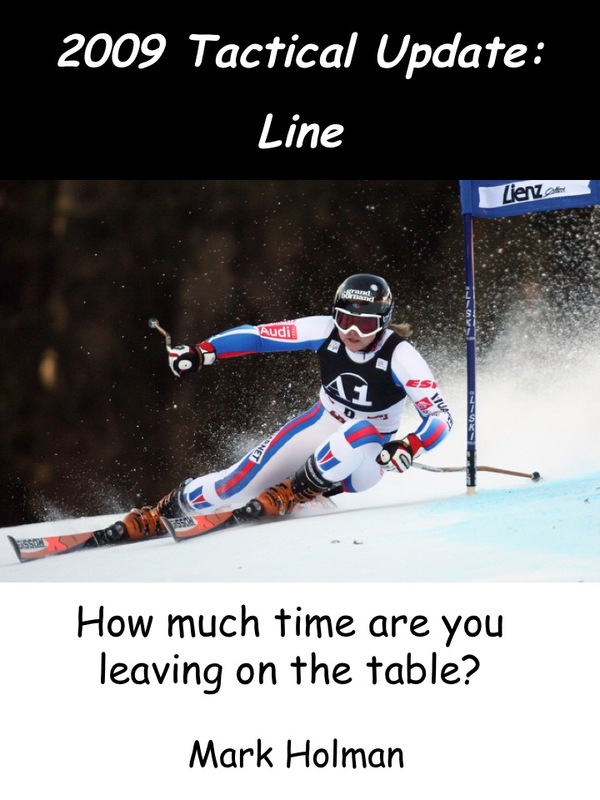 If the skis are not put on edge early, without pressure, this line is hard to get and the skier will simply do a wide arc, go well outside the gate and likely get late. This is also sometimes referred to as taking the line "deep". So here's a direct comparison of the high line vs. the direct line. The red area represents the loss of speed/time when choosing a high line.